The Pre-Kindergarten Syllabus is gentle by design. It is set up to be completed over 1 year or 2 years depending on the student’s ability and interest. The syllabus contains detailed daily lesson plans for Religion, Mathematics, Phonics, Handwriting, Listening Skills, Art and Social Studies. It also contains a variety of teaching resources, suggested daily schedules, teaching tips and several lists of grade level appropriate literature. We have provided below a sample of the first week from the syllabus along with a list of the books used in the syllabus. In Religion we use A Catholic Child’s First Bible by Rev. Victor Hoagland, Once Upon a Time Saints, and Glory Story CD's. In the second year of Religion we use the Children's Bible (Golden Press) to familiarize the student with the New Testament Bible stories that will help him to acquire true principles in order to form correct judgments about the world. In Mathematics we use MODG's Math Foundations texts to introduce the student to the world of numbers and basic addition and subtraction. In Phonics we use MODG's Alphabet Birds to introduce the child to letters along with beautiful art and science. In Writing we use MODG's Writing Skills followed by Writing our Catholic Faith PK to introduce the student to the formation of letters. In Listening Skills we use The Harp and Laurel Wreath which provide excellent selections of poetry for the parent to read to the student and for the student to memorize. In Art we use MODG"s Pre-School Art to introduce the student to art appreciation. In addition the syllabus has a list of good literature for the student. 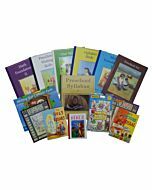 You can purchase the materials for our Pre-Kindergarten Syllabus directly from MODG at modgbooks.com! Our bookstore carries two PreSchool kits of materials for your convenience: the Complete Kit and the Essentials Kit. The Complete Kit contains all of the required items from the Pre-K syllabus, along with a selection of the reading books. The Essentials Kit contains the basic items needed to complete the syllabus, but does not include extra reading books or manipulative math aids.